See our Black Tote in our design studio. This iconic tote will carry you from the weekdays to the weekend with it's spacious interior, long comfortable straps and 2 handy pockets. Get yours today. Please let us know your email address and we will let you know when it is in stock. 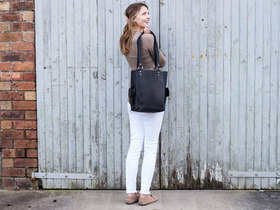 Our classic leather tote bag has been lovingly handmade from quality leather using traditional leather crafting skills. There’s enough room in the bag for your daily essentials. Each bag consists of one main compartment and a small pocket on either side of the bag, each fastening with a magnetic clip. Sure to become your new favourite leather handbag, Scaramanga’s distressed leather tote bag is a classically styled bag for all occasions. Our black Hunter leather has been specially tanned and finished to have a distressed vintage leather effect, which means over time and with exposure to sunlight, the leather's initial black colour will fade to a grey or dark aubergine colour.